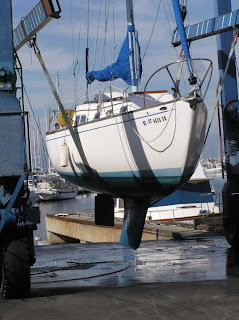 On a calm, warm September morning, the Ericson 30 was lifted out of the water on a sling, the bottom was power-washed, and it was set to dry on a cradle in the boat yard. At mid-morning, the surveyor arrived and set about making his inspection, which lasted more than an hour. A marine survey is not required when buying a boat, unless you want to buy hull insurance that will pay you if the boat is damaged or sinks. Insurance companies don't write hull policies without a survey. But you can buy just the liability insurance that marinas require without a survey. However, some marinas also require a boat survey, even though they don't care if you have hull insurance. They just want to make sure that your boat is not going to become an abandoned derelict in their slip. Not having a pre-purchase survey is risky. But it happens. Several weeks ago, an acquaintance had the Newport 30 he purchased without survey hauled for bottom painting. It was a donation boat that he got for $5,000. It had not been hauled since 1996. It could have been virtually worthless if it was suffering from severe osmotic blistering. But he was lucky. The bottom did have more than two hundred blister bubbles, but they were small and easily and economically repaired by grinding them out, filling with epoxy filler, and repainting. The Ericson 30 I was buying had no blisters. The seller said there were only three minor blisters a year earlier when he had it hauled for his own pre-purchase survey. Those blisters were fixed and the bottom was repainted. The surveyor I hired found only a few problems with the boat, all of which were fixed by the yard, or by me while the boat was hauled out. I found a few other things I also wanted done. The days mounted and so did the yard bill, eventually reaching about $3,800 for two weeks of work. There were useless old thru-hull fittings for an inoperative knot meter and a missing depth sounder. Add $255 for new fittings to install the new $300 combined unit that I purchased. Several repairs and improvements were required or desired for the head and its holding tank. I made the mistake of asking for some items after other work was completed. Altogether about $1,500 in parts and mostly labor went into the head system. I'm a little shocked at the cost of that portion of the work. It's compiled from several different yard bills, which I had never totaled before. I've been wondering if I was cheated? Thinking back, I know that I hired out the work rather than tackle it myself because it is hard, unpleasant work in tight spaces and I didn't know how to do some of it. I also recall that some of it took four hands--a pair inside the hull and a pair outside the hull. That second pair of hands may not have been busy all the time, but had to be there when needed. So the hourly labor rate doubled. I do recall going over all the labor charges with the yard at the time I paid the bill. My experience with a variety of boat yards is that the hours charged for labor always seem excessive. And when I work on my boat myself, it always takes two or three times longer than I anticipate. The rudder was fine, but I thought it was too loose and ask to have it shimmed up. Add $170 labor. After the boat was supposedly ready to be launched, I broke the ball-valve off a thru-hull for the cockpit scuppers. An additional yard bill ensued. The broken part was very difficult to see and broke when I put a lot of pressure on it trying to replace a scupper hose. I'm glad it happened in the yard. The thru-hull, ball-valve and associated fittings definitely needed to be replaced. Finally the launch day came. I had paid the seller what I owed him. Arrangements were underway with the Foundation to transfer the lease-purchase to me, and at last, emotionally at least, it was my boat. It wouldn't really be my boat until the following summer when I could exercise the purchase option portion of the lease agreement. But it was certainly mine to spend time and money on. And daydream about all the repairs and enhancements I wanted to make.